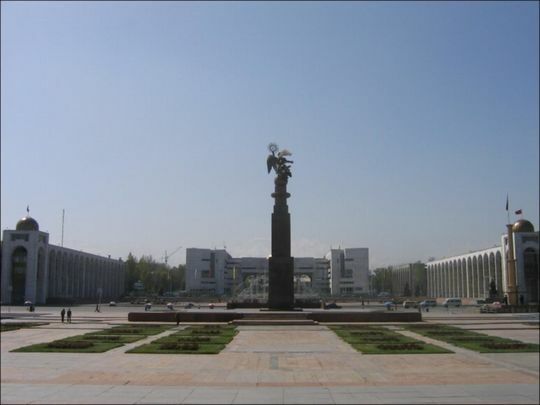 Bishkek (Бишкек), with a population in 2012 of more than 900,000, is both the capital and the largest city of Kyrgyzstan. Bishkek is, however, an interesting example of a czarist planned city; laid on a grid with wide boulevards flanked by irrigation canals and large trees, buildings with marble façades, and Soviet apartment complexes. Many young travellers find Bishkek's nightlife a delight and the people are friendly and very hospitable. Bishkek is a city of many young people that hang out in clubs and small cafés. Kyrgyzstan has the most liberal tourist visa regime in Central Asia, so Bishkek makes a great place to start a tour of the silk road and collect your visas to neighbouring countries. The renamed town of Frunze became capital of the new Kyrgyz ASSR in 1926, but it was renamed Bishkek (the Kyrgyz form of it's old Kazakh name, Pishpek) in 1991. Bishkek's Manas International Airport IATA: FRU is a 25 minute drive from the city centre. Most of the international flights depart and arrive at very early hours of the morning. Marshrutka route 380 departs from outside the airport terminal and goes to central Bishkek (interscetion Chuy ave/Jash Gvardiya Blvd) fare is 50 som. While there are occasional reports of requests for bribes or hassling of passengers, it's rare. Airport personnel are generally formal and sometimes hospitable. There is several ATMs in the arrival hall of the airport, and several small cafés and convenience shops that are open around the clock. Manas International used to be home to a US Air Force Base that, in the past, provided logistics support to forces in Afghanistan. Keep your baggage tag receipt with you as your receipt may be checked by airport security to make sure you have picked up the correct baggage. There are many aggressive "unofficial" taxi drivers awaiting all incoming flights. The normal rate charged by the major taxi companies to the city centre is KGS600 (as of June 2017), so you should attempt to bargain for a similar rate if you choose to take one of these taxis. Hint: you can catch driver on second floor of the road, when he drops off passengers for departure for cheaper price 300-350KGS(jan2015). There is a twice-weekly train service to and from Moscow, called the "Kirgizia" with two days operated by the Kyrgyz railways, and the other two by the Russian railways. The train has 2- and 4-berth sleepers and a restaurant car. Notice that all trains go through Uzbekistan and Kazakhstan. In addition, there is a service that goes to and from Balykchy on the western edge of the Issyk Kul lake. Although slow (6-8 hours) and with minimal accommodation, it is one of the most scenic rail trips in Eurasia, sneaking through a thin mountainous alpine pass to the lake. As of July 2012, this service is running again, on a seasonal (summer) basis. Note that the taxi/bus road trip is only 2.5-3h. Bishkek is approximately a 3.5 hour drive from Almaty, Kazakhstan along a relatively good highway. There are also additional long distance road connections to Taraz, Kazakhstan (leading to Shymkent & Tashkent, Uzbekistan). Hourly minibuses from Almaty Sairan bus station costs KZT1500 and will take at least 4 hours, depending on how long the border crossing takes. There is a rest stop at a gas station about an hour from the border. At the Kazakh-Kyrgyz frontier you have to step out with all your luggage and make customs control by yourself. If the checks last too long, the bus can leave without you. Ignore the money-hungry taxi drivers waiting for you, at the left of the road is a parking place where local minibuses depart to Bishkek for KGS30 (July 2016). The immigration control going to Kyrgyzstan involves, first, a chaotic crush of people trying to get through up to 8 booths manned by Kazakh immigration officers (forget any queuing manners you may have), followed by a walk over the border river bridge, and a smaller, less busy Kyrgyz immigration building. For non-Kazakh/Kyrgyz nationals, you'll need to walk into the Kyrgyz immigration building and knock on the mirrored window door on the left as you enter to get the attention of the officer to come and take your passports for processing. He will disappear for 5 minutes and re-emerge with your stamped passports, you then go on through to meet your minibus. UPDATE July 2018: there is no need to secret knock on a mirrored door, just wait in line. If the official in your line doesn't speak English, he will hand your passport to one who does, and you will be ushered to the front of that line. You will be asked a few perfunctory questions (e.g. how long in Kyrgyzstan, purpose of visit, etc) and you will be waved through. There are no normal buses between Bishkek and Osh. Bishkek-Osh highway is a narrow mountainous road (though in a good condition) and big buses or public passenger minivans are not allowed to cross the Tor-Ashu and Ala-Bel passes. Most popular option is to take a shared taxi, from the taxi stand near the Osh Bazaar. You'd better start in the morning, not to miss a great view along the road. Try to reserve a front seat, even by paying a hundred soms more, because the driver will squeeze 3 passengers in the back seat. Fare in 2012 was KGS1,000-1,500. There are always many cars waiting there, departing when full, until about 21:00. Another, more comfortable overnight option, is to take a cargo-passenger minivan ('busik', ‘бусик’) from Dordoi Bazaar. Price was KGS500-700 in May 2012, they have comfortable sleeping bunks, but windows are small and you will pass all the most beautiful scenery in the night. They between 15:00 and 18:00, no need to reserve seats in advance, come there and choose a car and driver that you like. Ask for 'stoyanka (gruzovyh) busikov na Osh' ('стоянка (грузовых) бусиков на Ош' ,'(cargo) vans stand to Osh'). Actually they arrive to Kara-Su market, 30km from the centre of Osh. The shared vans or taxis from Kara-Su to Osh are frequent and cost KGS30-40 more. In reverse direction its similar, take a shared taxi to Bishkek from taxi stand near the Bazaar in Osh, they leave as they fill up, all day long. Or go to Kara-Su market to catch a cargo-passenger minivan to Bishkek. It is also possible to buy a seat from a truck for about KGS500. The trucks leave the bazaar in Osh daily at 15:00. Truly adventuresome travellers may want to attempt to get to Bishkek via the Chinese/Kyrgyz frontier crossing over the Torugart Pass. The pass connects Kashgar via an important route that runs along what was once the ancient Silk Road, linking Western China with the heart of Central Asia. The pass tops off at a height of 3,752m and is known as one of the most frustrating passes in Central Asia, as both sides can be closed for holidays, early snowfall, or just for seemingly random reasons. Only attempt this route if you have time and your patience can handle it. You will need a special permit to cross the border at Torugart. For an easier crossing from China, go first to Osh through the Irkeshtam Pass. Taking bikes on public transport. Unfortunately the public transport in Kyrgyzstan consist mostly of minibus. However, it's usually possible to fit two bicycles inside the luggage compartment in the back of the bus if you remove the front wheel, pedals and turn the handlebar. You may have to pay an extra fee of KGS100 for each bicycle while transporting them by buses between Karakol and Bishkek, and travellers paying KGS500 for each are not unheard of. The night buses are usually big buses with enough space for bicycles. Note that the tunnel at the Tör-ashuu pass on the highway between Bishkek and Osh isn't at 2500m as it is mentioned on most maps. The tunnel is at 3100m. Kyrgyzstan's capital, like many places in the former Soviet Union, has an extensive network of minibuses, known as marshrutkas. There are hundreds of mini-buses (marshrutkas) that ply all parts of the city. They generally cost KGS10 (KGS12 at night). Go to the Bus.kg website to find out which mini-bus number you should take or download the free Android app to use offline on your mobile phone. Major stops are near the Tsum department store and Philharmonia. They typically have around 14 seats, with standing room for around ten extra people during busy periods. Marshrutkas are easily identifiable and display their number and basic route information (in Russian) on the front. To flag one down, simply hold out your right hand, parallel to the ground. Once you get on, pay the fare to the driver. When you want to get off say, "ah-stah-nah-VEE-tyeh" (Stop!). Note that although there are bus stops, and according to the law marshrutkas should be hailed at bus stop only, but it is not followed too much. So, in practice you can ask driver to stop anywhere and and he will drop you off at any point on their route. Bishkek also has a bus and trolleybus system which is less extensive and generally slower. They only stop at designated bus stops and operate only till 22:00. The fare is KGS8 in buses and in trolleybuses. Travellers enter at the back door and leave at the front, where they have to pay on exit. Bus and trolleybus routes can also be found on the Bus.kg website or mobile app. There are several private taxi firms in Bishkek that you can easily reach through their three digit numbers including: 150, 152, 154, 156, 166, and 188. Most daytime taxis throughout the city will agree a flat rate of KGS150, rising past 22:00. Alternatively many official taxi companies will have a meter that will be turned on on request. There are also numerous "gypsy cabs" situated at nearly every intersection. While most travellers and long-time expats report no problems, you are cautioned to be aware, especially at night and near nightclubs. Generally tourists use the local taxi services which can be reached through several numbers: 150 Euro (Evro) Taxi, 152 Super Taxi, 156 Express Taxi and 188 Salam Taxi. A taxi for a day can be negotiated. An hour drive to mountain or to a lunch and then back again later can be KGS800-1000. There are also by the hour car with driver services ranging from KGS400-1000/h. One company is IHN. When travelling by taxi out of Bishkek it is generally cheapest and easiest to try arrange a taxi from the Western Bus Station, the competition for service here will generally be higher and therefore allow you to arrange for a cheaper ride and/or better car. Ala-Too Square - The main city square is a vast expanse of concrete that ceased to be called Lenin square in 1991, and is the site of frequent political demonstrations and regular festivals. A statue of Lenin was the focal point until 2003, before he was banished to a much less conspicuous location behind the museum and replaced by a statue of Erkidik (freedom). At night many vendors set up photograph and karaoke booths, and there's a synchronised sound and light show in time with the fountains, however travellers should avoid visiting the square after dark. There is also a military monument with an hourly changing of guards. State Historical Museum - This museum sits between Ala-Too Square and the Parliament building. On the south side is an enormous statue of Lenin that was moved from the north side of the building after the Soviet Era. The bottom story of this three floor museum displays seasonal exhibits, while the second highlights Soviet-era achievements during the Communist Era. The top floor showcases the history and culture of the Kyrgyz people. Entry costs KGS150. Closed Mondays. Panfilov Park - While this park may be in need upkeep and renovation, it's a great look into the past when Kyrgyzstan was a part of the Soviet Union. Beware that few of the rides have any safety mechanisms, and the safety mechanisms they may appear to have are probably not functional. The ferris wheel offers a great view of the greater city. Osh Bazaar - If you're looking for a fresh sheep's head, locally made Korean pickled salad, shashlik or any other type of Kyrgyz snack, this is the city's best known food bazaar. Although it's certainly not Central Asia's most colourful bazaar, there are hundreds of products to choose from, especially in the spring and summer months when produce is fresh from farms in the outskirts of town. There is a separate clothes market south of the main produce bazaar. To get there you can take trolleybus 14 on Chuy, bus 20 or 24 on Kiev or 42 from Soviet. Like any crowded space, be wary of pick-pockets; however visiting the Osh Bazaar is a rewarding trip. There are also smaller markets including Alamedin Bazaar and Ortosay Bazaar, which are open daily but are at their largest and most interesting at weekends. Dordoy Bazaar is Central Asia largest market of imports, mostly from China. Beware of the policemen in Osh Bazaar they will "invite" you to their station to check your paper then proceed to steal your belongings, do not make eyes contact if you look like a foreigner, do not ask for directions. You can buy tickets (KGS200) for the Zhirgal Banya (baths) from the ticket office around the side. There's a sauna, ice-cold pool, and for an extra KGS200 an attendant will lather you up, scrub you and then hose you down. For those into a little bit of self-flogging, birch branches are available free. One of the best Spa in Bishkek is Mystic Spa Bishkek offering authentic Indian Ayurvedic Massages for relaxation as well as rejuvination and therapies (Shirodhara, Podikizhi, Kati Vasti etc.) and Thai, Swedish Balinese massages by expert masseur girls from India and Thailand. It is a great value for money Spa and is popular for not just massages of all kinds but for high quality facial care, pedicure, manicure etc. as well. Prices are unbelievably low, (Manicure just 5$, Pedicure a mere 7.5$ and Spa therapists and awesome interiors are simply top class. "Prospekt Chui 219 (crossroad Toglokmoldo)""Phone="+996 555 45 44 33" They have great discounts on package deals and Health packages also. If you want to swim, the Karven Club has an outdoor pool which is perfect for a blistering summer's day, and there's a also a modern gym and fitness centre. For one hour it's KGS400 but it's much better value to pay KGS500 for a whole day of use and hang around for as long as you like. A trip to Green City spa & resort can be a great way to experience local culture and customs, enjoy some serious relaxation at Turkish hamam, finish sauna, Russian banya and remove the grime that accumulates while you travel. Bishkek is a cheap place to learn Russian (or Kyrgyz). A private 1h30 lesson with a native Russian speaker should cost between $5-7. Courses are also available at the American University of Central Asia  and the Kyrgyz-Russian-Slavic University . There is also a private school that caters to individual learning: The London School in Bishkek . This school offers Russian and Kyrgyz to anyone at any time of the year for as little as KGS750/h. During the warmer months they are often full so book in advance. If you choose to have your accommodation booked through the school be careful as the dormitories have roaches in summer and rats in the winter. As well, they may try and move you to an apartment at an increased rate that will be often 6 to 7 times above the market rate, and will often have more students living there than there are bedrooms. American University of Central Asia - AUCA-Bard Study Abroad Program offers intellectually adventurous students a unique opportunity to study side by side, in English, with peers from 25 different countries at the region's most prestigious university. Students interested in Central Asian Studies, Soviet Studies, or Russian and Central Asian languages will find that AUCA-Bard provides an exciting and rigorous liberal arts curriculum that develops students' skills and attitude of mind; both of which will foster sensitivity to the region's rich traditions, as well as an adaptability to its democratic development. A number of international organisations have offices in Bishkek, however most employees are recruited from abroad. If you speak Russian, there might be occasional opportunities to find temporary or long-term work. There are also a number of English language schools that will employ native English speakers. A typical Kyrgyz meal will feature starchy foods like bread, rice, and potatoes, usually centered around some sort of meat, usually lamb, mutton or beef or even sometimes horse meat. Some of the more popular staples are plov, a Central Asian dish consisting of a bed of rice cooked in oil, topped with lamb or mutton, shredded carrots, and occasionally whole garlic cloves. Shashlyk, a marinated and grilled lamb, mutton or beef kebab, is popular all over the former Soviet Union and is typically eaten with bread, raw onion slices, a voluminous amount of vodka. Samsas, much like the Indian samosa, are available at roadside stands across the city. Usually these are cooked in a tandoor oven as a puff-baked pastry and filled with onions, mutton and mutton fat. The national dish of Kyrgyzstan is called besh barmak (literally: five fingers, because the dish is eaten with one's hands). It usually consists of horse meat, although sometimes mutton or beef is substituted in, that has been boiled and served mixed with home made noodles. A sheep's head is usually served along side it. If you can land an invitation to a wedding in Bishkek, you'll most likely get a chance to eat besh barmak, although you can also find it are traditional restaurants. Russian dishes are also fairly ubiquitous in Bishkek because of the large number of ethnic Russians who still live in the city. There are a also growing number of restaurants and cafes catering to more varied tastes. Uyghur food is popular and fits the taste of many westerners as well as locals. Eg, the chain Arzu has a few restaurants. There are hundreds of stands that sell gamburgers, a local adaptation to the American hamburger but really share little in common. They are sliced döner kebab-style meat served on a bun with cole-slaw, cucumber, mayonnaise, ketchup, and some fries. They usually cost around KGS60. One of the most popular gamburger stands in Bishkek is at the corner of Sovietskaya and Kievskaya, across the street from the main post office. It's a popular area for local students to pick up a cheap meal and they even serve the rare chicken hamburger. For some pre-independence nostalgia, try the cafeterias of government ministries and universities. For about a dollar you can experience what it was (and still is) like to eat Soviet-style cafeteria food. Steinbrau Brewery - on Gerzen Str. 5 near central moscue - the only german style brewery with best bier in Kyrgyzstan and german food. Establishes in 1997 it is also one of the oldest restaurants in Bishkek. Large beer garden is opened from May to October and is an oasis of calm in the city. Cafe Stari Edgar - Located behind the Russian Drama Theatre; this is one of the most popular places with the expat crowd. In the summer, there is ample outdoor seating and in the winter, the bomb-shelter style building (decorated in a unique nautical motif, interesting considering the landlocked location of Kyrgyzstan!) presents Bishkek's most original dining venue. The food tends to be average, but the house band has entertained generations of visitors. Sugar & Spice - (146 Toktogul St., slightly east of the intersection with Isanova) This Indian-owned restaurant serves good Indian food, including a lunch buffet on weekdays for KGS 250. Aria - One block south of Vefa Center, this Iranian-owned restaurant serves good Iranian and Turkish dishes while also offering Russian fare. The multi-flavored kalyan-hookahs attract a varied, hipster-like crowd. Metro Pub - (Chui and Turizbekova) This is where international aid workers, embassy staff, mining personnel, and Manas Airport contractors from all come together to down a pint and grab a decent meal. The staff are also quite popular and are used to back and forth flirting between themselves and the expat patrons. Especially crowded on St. Patrick's Day and Halloween. (~210-300 som) -- Aussie Butcher is now located in back of Metro pub. Four Seasons Restaurant - Delicious food with a large selection of European and Asian cuisine. Outside dining is available in the summer. Live music year-round, baby-sitting for the kids, and popular with foreign dignitaries. While it's not to be confused with the Four Seasons Restaurant in New York City, it's a great dining experience nonetheless. Be careful not to break anything, they will add large amounts to your bill. Kafe Coffee - two locations- 9 Manas Ave/South of Moskovskaya & 40/1 Togolok Moldo, which is south of the City Sports Hall towards Chui. Both locations serve a variety of non-alcoholic, heavily caffeinated drinks and feature free Wi-fi. The Togolok Moldo site also has outdoor seating. As of May 2010, The Kafe Coffee located on Manas uses the SAIMA CARD - a pay system of Wi-Fi. Sierra Coffee - Opened in Spring of 2012-57/1 Manas, next to the Russian Embassy, between Kiev and Toktogula, has brought a near "Starbucks" experience to Bishkek. Excellent coffee and coffee specialist drinks. Good breakfasts, sandwiches and wraps. Free Wi-Fi. Counter service by English speaking staff. A place to network and to meet other English speakers. Sierra also roasts their own coffee, offering fresh roasted coffee for sale in a variety of origins and roasts. Second large location opened in 2014 in the Tash Rabat center on Gorky. Several small location around the city as well. Kafeman - (Isanava/Chui, south of Beta Stores) This recently renovated cafe used to be Bar 2x2 but as of July 2012 is an upmarket cafe also selling alcoholic drinks and also has an outdoor seating area. 12 Bar (Razakova Str. 32)  - set atop one of higher buildings this makes a great place for a rooftop drink. A plush place where Bishkek's young and wealthy go to see and be seen - hence good idea to dress up at least a little. Drinks around $2-4 a pop. Fire and Ice - (Chui and Erkindik) This popular, Pakistani-owned disco near the Bishkek city centre is located right above a bowling alley. Retro Metro - You'll find the DJ spinning from inside a the front section of a tube train engine (hence the name). The 80s kitsch is a popular spot for really late night partying. Promzona - A trendy Russian rock establishment with a mostly Russian clientèle. Jazz musicians play on Tuesdays with rock and blues acts on the weekends. Check out their extensive drink menu. 600 soms entry fee. Sweet 60s - (Molodaya Gvardia and Kievskaya; near cinema Oktyabr) Live music everyday, with jazz evenings on Wednesday and Sunday. Golden Bull - (On Chuy, next to the White House. Enter from the back yard of another building.) KGS300 for entrance. Beers cost KGS200. the new staff are not that friendly as it used to. Do not go alone in any condition. GQ Exclusive night club -(Location: пр. Чуй, Phone (551) 44 44 11) Located by Sonaba not far from the Sports complex and movie theater. Upscale night club with dancing girls on the stages. Opaque floors that light up for ambience with the music. There's also a show at the bar where they light the bar on fire. Generally 500 soms entry unless you make connections. There are many national drinks which are very healthy. Kymyz is a fermented dairy product traditionally made from mare's milk. Kymyz is a dairy product similar to kefir, but is produced from a liquid starter culture, in contrast to the solid kefir "grains". So, it is advised to taste Kymyz, during spring and summer seasons. Also, try the slightly fizzy wheat drink called "maksym" sold at stands of Shoro company around the city. It is reportedly a hangover cure. While relatively safe compared to many major Asian cities, one should use caution after hours in Bishkek. It is highly recommended against taking an unaccompanied stroll after dusk and you should definitely avoid parks at night. Pickpockets are a major problem in and around markets, especially at Osh Bazaar. Look out for young men with large plastic bags "bumping" into you! Keep your valuables at your accommodation if you plan to visit the markets, and if you bring a purse, camera, backpack etc. keep it in front of you. Nightclubs and their surrounding areas can be a hotbed for crime in the form of theft, prostitution, or even assault by people waiting to take advantage of an unsuspecting traveler or expat. Ask locals or hotel staff which areas are safer than other and take precautions if you plan on club hopping. Do NOT walk from nightclub to nightclub at night; instead spend the KGS100 (USD2.50) on a taxi. Potential muggers have been known to wait outside bars and clubs (especially the ones frequented by ex-pats), follow drunk ex-pats, and then rob them. Keep a cool head and be aware of your surroundings when hanging out inside and outside of nightclubs. Most clubs have numerous buff, semi-professional security guards, but you should be vigilant nonetheless. Do not leave any belongings on the table while you go to dance. Be careful around the taxi area outside the club; occasionally, unsavoury characters pick this location to mug drunk foreigners as they leave the club late at night. You might not get much help from club security when it comes to theft. Bishkek has a large number of prostitutes and sexually-transmitted diseases are on the rise in Kyrgyzstan and Central Asia. Always take proper precautions if you plan on being sexually active. If you are a victim of a crime, you are probably best served by reporting the incident to your embassy, rather than to the militsya (police). Sometimes militsya will approach foreigners and ask them for documents, such as your passport. It's best to keep a photocopy of your passport and leave the original at your hotel if you can. On the rare occasion they try to fine you for having "the wrong visa", you are most likely just being set up for a shake down. Be polite, but firm, in your refusal and insist that you be put in touch with your embassy first. Sometimes policeman approach you on the street, especially if you look like a traveller (carrying a big backpack, etc), and ask to check the belongings. Often, their aim is to steal your valuables and/or money during this check. They can do it very professionally, and you only will notice later, that something disappeared. The best way is to pretend you don't understand them, trying to call your embassy, or just walk away ASAP. Also keep your valuables in a safe place and don't expose them to others all the time in Kyrgyzstan. Even sometimes normal local people, who invite you to have a tea at their home, if they see that you left some valuables unattended, have too big temptation for stealing it. Irrigation ditches and other holes in the ground can seriously injure the unaware person - especially when walking at night. Many streets are poorly lit or not lit at all, and it is easy to fall into them. Avoid manhole covers, grates, and similar fixtures - they are frequently loose and may also cause you to fall (or they may be missing altogether)! Bishkek is the Eastern Europe of 30 years ago, except with mobile phones and internet access. It is more or less a museum relic of the former Soviet Union Bloc. Despite Kyrgyzstan's poverty and the decay of its infrastructure, Bishkek remains a relatively safe, clean, functional city. Bishkek is not an old city and possesses no ancient landmarks, but it nonetheless has its own kind of charm, which often arouses nostalgia in people who knew the old Soviet Union. For most travelers, Bishkek is merely a stop on the Silk Road to refresh supplies before returning to the mountains. However, expatriates who call Bishkek home generally consider themselves lucky to benefit from its easygoing lifestyle, open-minded spirit, party culture and low cost of living. If you come with the right expectations you might find yourself pleasantly surprised! A popular local source of information for tourists is the regularly published ex-pat run Spektator magazine which features tourism and culture articles focusing on Kyrgyzstan and the wider Central Asian region. Free Wi-Fi is now widespread. Most "foreinercafes" have free wifi (Coffee, Foyer, Obama, Cyclone, Pirogoff-Vodkin, Vostok Zapad, Tubeteika, Movie City Bar, Buddha Bar, etc). There is also free wifi at the vefa shopping center on the corner of Gorkiy and Soviet. The 4,000m (13,000 ft) "foothills" of the Tian Shan range (Celestial Mountains) begin just thirty minutes outside of Bishkek. Ala-archa canyon - This park goes the length of a beautiful valley where you can hike in several kilometers to a glacier. Inside the park is a hotel and couple of small cafes. Taxi services can take you and wait a few hours for about 1000 som ($25). From the newly renovated lodge you can trek to the stone house located at 3300m and it takes about 4-5 hours. The stone house charges KGS500 per night for bunk beds or you can camp. From there you can climb Corona Peak or Uchitel peak 4585m or head to glacier. This page was last edited on 19 December 2018, at 11:41.